Museum Textile Services is located up in Andover, MA, but despite the distance, they’ve previously consulted with the JNBC about our historic textiles (primarily, the rug in the music room that is Not Supposed To Be Stepped On). I have several years of experience in hand sewing and the same in historic costume research, and they agreed to take me on. 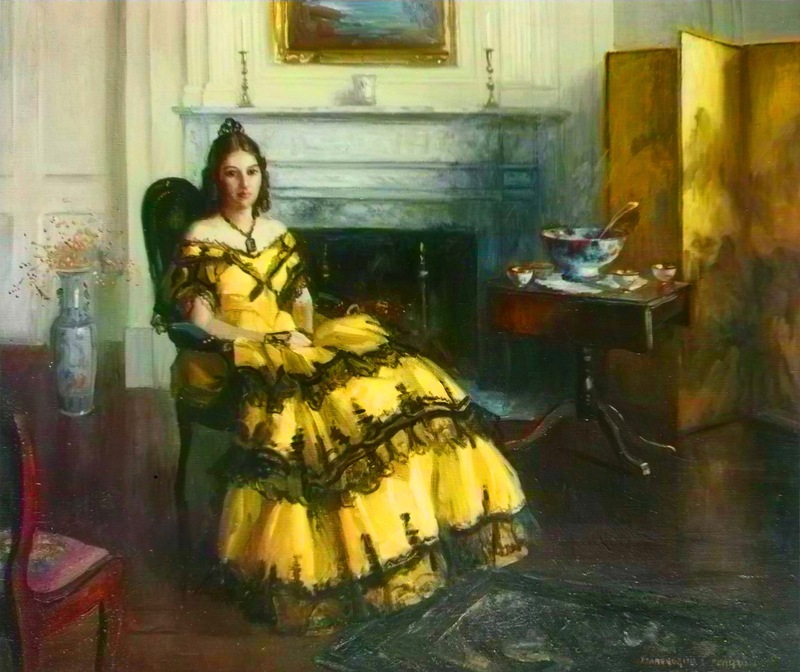 I had expected to be working on small, risk-free projects (understandable, if not exciting), so imagine my surprise when I was allowed to contribute to a large, visually stunning project: an enormous yellow and black Victorian dress. It had made quite the impression on me even while displayed limp on the table, so it took some time for me to get over being able to touch it, let alone alter its state for conservation! I am extremely thankful to have had the experience of working on it over the span of my internship, both physically and analytically: I was involved with discussions of the ethics of preservation and conservation and then given the responsibility of investigating its history and materiality. To me, this particular dress was made of mystery, (wood in the hem! lasting bright color! so much alteration! ), and since my most abiding love is research, I knew I wanted to learn more. To my eternal gratitude, MTS supported me in this, and wanted to know something in particular: What on earth was it dyed with? As I mentioned before, the dress had a strong visual impact: it’s made out of an extremely bright yellow silk taffeta and is decorated with striking black velvet ornaments and bands of black lace. (Taffeta is a plain weave; the color, which I like to call ‘Longfellow Yellow’, is enough on its own!) This unique yellow sometimes appears a warm gold and sometimes a greenish-lemony tone, but the most shocking thing about it is the fact that it is still so colorful after all this time. There are many Victorian gowns that remain bright - generally due to the newfangled chemical dyes of the 1860s - but many, many more in which the colors have faded and changed. The effects of ‘fugitive’ dyes vary by dyestuff and by the material that they were used upon, transforming once-solid colors like purple to sad, dingy browns after a few years. There were also quite a few potential dyes, some of which have been in use for millennia and some of which were extremely new to manufacture, so I was excited to get down and dirty with 18th and 19th century dyer’s and chemists’ manuals. The early Victorian era was an inventive one. Dye technology underwent a radical change after 1858 as chemical dyes were created and marketed. It would be understandable to see a lasting, bright color like this one after 1860, but we weren’t sure if this dress could have been made that late. So the first step was to date it by the means that were possible: style, silhouette, and construction. I searched through extant museum garments, contemporary periodicals, and the provided letters of owner Fanny Longfellow, who mentioned new dresses from Paris several times. Dating by style can be a wiggly process, especially when the locale is somewhat removed from fashionable centers like New York, but I determined that it probably dates to 1855-58. So what did that mean for Longfellow Yellow? In the 1840s and ‘50s, the color yellow could be created with dozens of natural plant dyes. The four most commonly found in dyer’s manuals are quercitron, weld, fustic, and turmeric (which, like saffron yellow, came from India). Quercitron was the most common at the time due to its “strength and economy,” and was obtained from the Eastern Black Oak, which is indigenous to North America. But weld, not to be discounted, had been the most popular yellow dyestuff for centuries and was still used a great deal. Turmeric would have been the most expensive option, but it’s not quite the right tone and it fades easily. The last option, fustic, is neither this bright nor this lasting. While the high-end dyeing of imported silk satins and lustrings (taffeta) was in demand in early 19th century New England, the costs had dropped by the 1840s. American dyers stayed as up-to-date as possible with European advances, and if we didn’t already know that it was most likely French, this gown could conceivably have been made in New England or New York. Weld and quercitron seemed to me to be the most viable options. They can both produce a bright lemon yellow when combined with a particular mordant (which sets the dye), and they fare better over time than the others. Weld, in particular, is famous for leaning to cooler, greenish yellows, while quercitron was more popular for warmer tones. It is hard to say if one seems more likely than the other; without concrete evidence, I can only state that quercitron is more probable because it was more popular at the time. From its 1775 introduction by the British chemist Edward Bancroft, it became known as a bright and colorfast dyestuff, better than anything yet known. While weld was known to diminish in contact with air and light, quercitron was not as prone to fading. Most importantly, it was both cheaper and easier to use. I’ve made a big deal about the amazing chemical dyes after 1860, but it is actually possible for Longfellow Yellow to have been created with a non-natural dye despite the earlier date. While the first chemical yellow was invented in 1861, it had a semisynthetic predecessor: picric acid yellow. Picric acid was in production by at least 1855, and not only was it more colorfast than any vegetable dyes, but it could also produce both greenish and golden yellows. If this dress was indeed dyed with picric acid, it could potentially be one of the earliest garments dyed semi-synthetically that was worn in America. sometime in the early 20th century, as the dress shows later alterations. This dress was worn by three generations of women between 1850 and 1950, and its enduring popularity was (and is!) entirely due to the marvels of 19th century dye technology. Take a bow, Longfellow Yellow. Kenna Libes is a second-year Public Humanities MA student who studies costume history and museum practice. Linda Jean Thorsen, "The Merchants and the Dyers: The Rise of a Dyeing Service Industry in Massachusetts and New York 1800-1850," Textile Society of America Symposium Proceedings (2016) 995: 491-92.